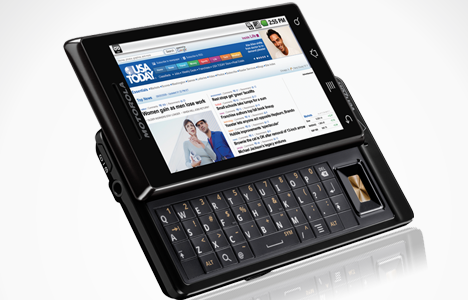 It’s already publicly known that Motorola plans to roll out an update to the Droid which will see it pick up Android 2.1. We’re waiting for the update to hit, literally any day now. As we wait for the official word, we thought we’d recap what you Droid owners will be seeing. Voice recognition for virtual keyboard. This is the feature that allows you to speak instead of typing. Anywhere you want. Pinch to zoom/multi-touch for maps, browser, and gallery. Google Maps 4.0 with all the new stuff, like Buzz. Enhanced Music application. New tabs at the top for easier access an navigation to artists, songs, albums and playlists. If you head to Motorola’s FAQ page, you’ll run into somewhat of a dead-end. Right now, it just says “There is a release coming, check back soon.” This is different from earlier, where it fleshed out all the details. Does this mean there’s more to the update? Did someone jump the gun and push out the news a little to early? Any of you Verizon customers stoked about the update? What is it that you are most looking forward to?